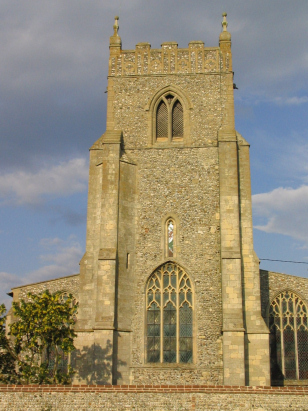 The parish of Wiveton lies in north Norfolk close to the North Sea coast. In Mediaeval times the parish was much closer to the sea being a small port but now the mouth of the River Glaven has silted and the village lies almost a mile and a half from the waves. Wiveton lies on slightly higher ground above the flood levels of the Glaven valley; it is inland of the coastal villages of Blakeney & Cley-next-the-Sea and midway along the coast between Cromer and Hunstanton. 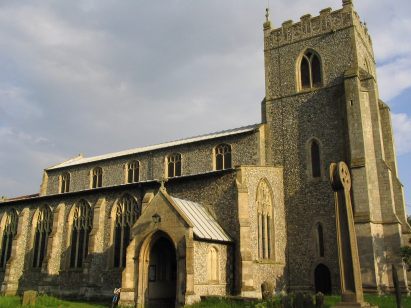 St Mary's church has a superbly scenic site with extensive views along the Glaven both up the valley to the south but mainly north towards the picturesque sights of Blakeney and Cley. The church sits at on the north-eastern corner of an extensive and attractive village green. St Mary's church was built during the 15th century, the church is mostly Perpendicular in style but there are some earlier Decorated style features notably the tower and chancel. The church's dominating position makes it a local landmark. The records from which this transcript was prepare are filmed on Microfilm MF699 in the collection of the Norfolk Record Office. This film is quite recent in its production and the standard of image was clear and contrasting throughout. The usual caveats regarding the standard of handwriting apply but on the whole this was a straightforward transcript to prepare and it is to be hoped few errors will have crept into its production.